More and more engineered flooring options are released every year, but few hold a candle to the looks and durability of rigid core flooring in Tacoma, WA. Rigid core planks are a type of luxury vinyl flooring that are stunningly realistic imitations of wood and stone floor coverings. This helps thrifty homeowners interested in the luxurious look of wood and stone find the style they want at a price that is much more in-line with their budget. The Floor Trader of Tacoma is proud to announce that rigid core flooring is one of a handful of water-resistant flooring options on the market today. This makes it a great option when you are looking to upgrade the flooring in your kitchen or bathroom. Interested in learning more about what makes these floor planks so unique? Then reach out to our flooring store today to speak to one of our trained, knowledgeable staff members. 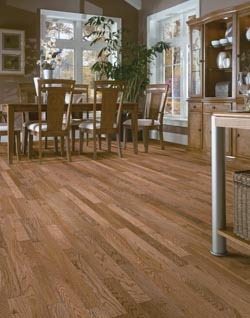 There is a conundrum for many homeowners and property owners when it comes to updating the flooring on their property. On the one hand, the areas that see the most traffic are also the areas where the most people are going to see the impressive flooring additions you have made to your home or business. On the other hand, these busy paths are going to see a lot more wear and tear than less traveled areas, which means the potential for a lot more damage to your floor. So how do you get a floor that looks great, but is also able to withstand all of the foot traffic? You choose rigid core flooring. Incredibly durable, this flooring option allows you to mimic the look and feel of the gorgeous flooring you want while ensuring its appearance isn’t diminished due to the amount of traffic it sees. This makes it perfect for any room in your home or business that you want to show off. Like all floor coverings, picking out the right style to fit your space is only the first step in the process. The installation process is just as important if you plan on getting the most out of your new floor. Thankfully, with our professional rigid core floor installation services, you can rest easy knowing that your new floor was installed the right way the very first time. Contact us when you are looking for a highly durable form of flooring. Our rigid core flooring is available to customers located throughout the Tacoma, Washington, area.